Remember, a shaved head is not for everyone. If you are extremely thin, have an oddly shaped head or scalp problems, then a bald head is probably not for you. If you decide to go for it, remember it will always grow back if you don’t like it, but knowing how to shave your head properly is important to getting a great result. Shaving your head will dramatically change your appearance and may take a bit of time to get used to. Many men look great with a shaved head. But to pull one off, you must have confidence in your look. Always shave your head for the first time at the start of the weekend to give you time to get comfortable with your new look (and get some color on your white scalp) before you face your friends and colleagues. Allow yourself a good half hour to get the deed done for the first time. It’s a tad trickier than shaving your face, but the process is similar. If you think you’re ready, here goes…. NOTE: THERE IS NOTHING MORE UNATTRACTIVE THAN A BALD HEAD FULL OF BUMPS, RAZOR RASH, AND IN-GROWN HAIRS. IT IS ESSENTIAL THAT YOU PREP THE SCALP, SHAVE PROPERLY, AND PROTECT AFTERWARD. DO NOT SKIP ANY OF THE STEPS BELOW. THE FIRST TIME YOU SHAVE, THE PROCESS WILL TAKE ROUGHLY 30 MINUTES. WITH TIME AND PRACTICE, YOU WILL GET THE ROUTINE DOWN TO UNDER TEN. GOOD LUCK. The first step in shaving your head is to remove as much of the hair as possible. Using a hair clipper with no guard, buzz the hair off as close to the scalp as possible. Always shave your head after or at the end of a shower, to soften the hair, open the pores, and cleanse the skin. Your shower should last at least 10 minutes. During the shower, lightly soap a washcloth and with a slight pressure glide the cloth all over your head against the grain. This will lift the hair for easier shaving. Rinse your head and the washcloth remain in the shower for few additional minutes. Next, apply a good shave cream such as Bluebeards Revenge Shaving Cream and let it stand for a few minutes to soften the hair even more. Stay away from gels or products which contain menthol, which will close your pores and stiffen the hair. Shaving cream is ideally applied with a badger hair brush (I love The Art of Shaving Pure Badger Brush) to soften and lift the hair. Never skimp on the preparation. This is vital to a good head shave! First time shavers should exfoliate the scalp with Baxter of California Face Scrub before applying the shaving cream (veteran baldies, should exfoliate twice weekly). Use a loofa or special facial scrub. Always have a hand mirror available so you can check the shave from all angles. You don’t want to miss anything. Also, shave your head at the sink and make sure you have bright lighting. Proper lighting very important. Use a clean, sharp razor such as the Gillette Fusion Proglide Power Razor. Start by shaving WITH the grain (the direction the hair grows). This will minimize cuts, irritation, in-grown hairs and razor burn. Glide the razor down the sides and back and then from back to front on top. Avoid applying pressure (you don’t want nicks or cuts) and rinse your blade often. Take it easy, pay attention, and be patient. You don’t want to rush or get clumsy during this process. After completing the shave, apply a small amount of lather to your hands and rub your entire head, checking for rough spots (sometimes you can’t see them), especially behind the ears and on the back of the neck. Shave over any missed places. If you must have a closer shave, re-lather and shave lightly against the grain. Remember, shaving an area over and over can cause razor burn, so try to avoid it. If you cut yourself, apply a moist alum block on the area to stop bleeding. After shaving, close the pores with a rinse of cool water. If using a shaving brush, always hang the brush to dry with the bristles facing downward. Shave your head daily. The process will be easier if you do. You will need to hydrate and protect the skin. Finishing with a good gel or balm such as Baxter of California After Shave Balm is key to leaving the skin soft, smooth, and protected. Shaving your head daily or every other day will ensure better results and keep you looking fresh. Always mositurize and apply a good sunscreen. 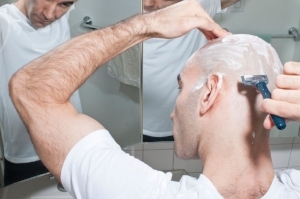 Headshaving is so common now, several companies now make products just for bald guys. Now, go out and proudly show off that bald head of yours!